Designed for the serious coastal angler, to be efficient, fast, smooth riding, and virtually maintenance free. The solid fiberglass hull, foam cored deck, and foam filled fiberglass grid system combine to create a lightweight incredibly tough and durable composite structure. The transom is a fiberglass and high-density foam core composite – no wood here. The hull’s sharp entry splits any chop while the shallow-V aft promotes easy planning and provides a stable platform while trolling, drifting or at rest. Available with 115hp, 140hp, or 150hp outboards. Complete with a self bailing cockpit and the full interior liner with molded two-tone non-skid floor (choice of White, Tan, or Lt. Grey) Rod storage under gunnels, gear storage, Battery switch, large stainless cleats, and automatic bilge pump. 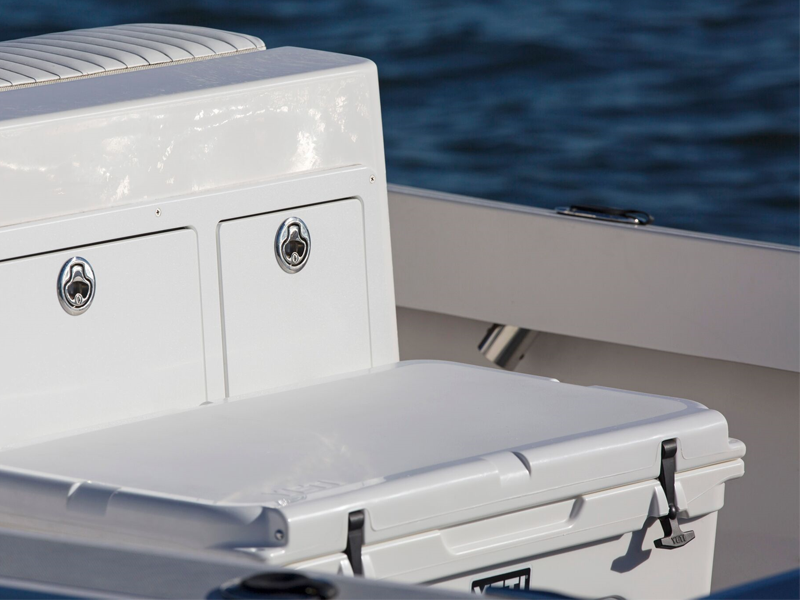 Your choice of an optional swivel back cooler seat, FRP Leaning post with tackle drawers, half dozen rod holders on either side of the console. Some other popular options include a T-Top with canvas top, electronics box, LED Spreader light, and rocket launchers.